The High Plains (Ogallala) Aquifer is the largest freshwater aquifer system in the world. It is considered a fossil aquifer; it was formed around 10 million years ago and recharge to its southern portion is extremely low, making it an essentially nonrenewable resource. The region has experienced a decline in the level of the water table since intensive irrigation became widespread in the 1970s, and currently, agriculture accounts for 99% of the over 20 million acre-feet of annual groundwater withdrawals. In parts of southwestern Kansas and in the Texas panhandle, the water table has declined by more than 150 feet. These declines are expected given current rates of extraction, but concerns that the aquifer is being depleted too rapidly have become common. Similar discussions have arisen in many of the world's most productive agricultural basins. In many places, policymakers have attempted to decrease rates of extraction through incentive-based measures that encourage the conversion to more efficient irrigation technology. Voluntary, incentive-based water conservation programs for irrigated agriculture are often considered win-win policies; their objective is to reduce the consumptive use of water for agriculture, and they also often contribute to the earning potential of farms through the yield-increasing effect of efficient irrigation technology. For this reason, these programs are extremely popular and politically feasible, especially where the resource is considered scarce. However, when the behavioral response of the irrigator is ignored, such policies can have unintended or even perverse consequences. Several studies have suggested that more efficient irrigation technology can actually lead to increased water use; farmers may adjust their crop mix toward more water intensive crops, expand their irrigated acreage, apply more water to the crops they plant, or their crops may benefit from higher evapotranspiration (Ward and Pulido, 2008; Huffaker and Whittlesey, 2003). This article is a summary of ongoing work (Pfeiffer, 2009) where we take advantage of detailed data on groundwater extraction for irrigated agriculture in western Kansas (WIMAS) to build upon these studies. A large-scale shift from standard center pivot irrigation systems to “dropped nozzle” or “low energy precision application (LEPA)” center pivot irrigation systems has occurred in western Kansas in recent years. The shift was aided by policies that subsidized the installation of more efficient irrigation systems in an effort to reduce the extraction of groundwater from the High Plains Aquifer. We evaluate the groundwater extraction data to determine if total water extraction actually decreased, as intended, from the statewide increase in irrigation efficiency. The state of Kansas was chosen for the analysis because of the availability of data; Kansas is a leader worldwide in the collection of data concerning groundwater use. The lessons from the analysis, however, are general; the behavioral response of groundwater users should be considered in conservation policy discussions. Gross irrigation is the quantity of water diverted or extracted, and net irrigation is the quantity of water consumed by the crop. 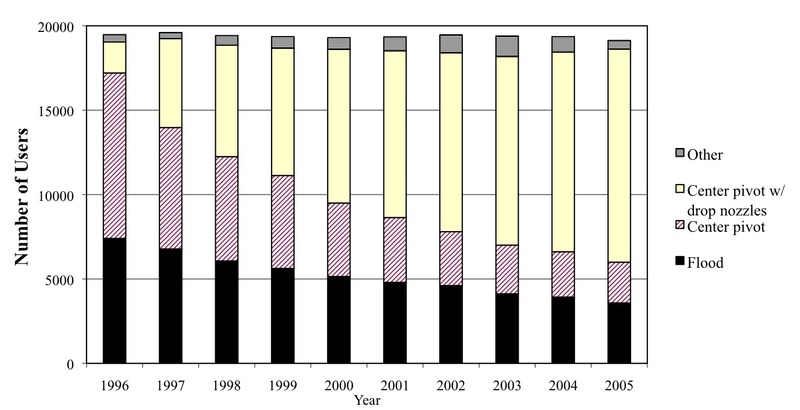 Efficiency, therefore, is the share of gross irrigation that is used by the crop (Burt et al. 1997). More efficient irrigation systems reduce the amount of water that must be diverted or extracted for a given benefit to a crop. Thus, to achieve a given yield, less water needs to be applied. This difference is often considered the “water savings” from improving the efficiency of irrigation technology. Center pivot systems with dropped nozzles are approximately 8% more efficient than traditional center pivot systems—through reducing drift and evaporation, and standard center pivot systems are up to 30% more efficient than flood irrigation systems—through reduced runoff, improved timing, and more uniform application (Perry, 2006; NRCS, 1997). Higher irrigation efficiency does not mean that irrigators will necessarily reduce water use, however. Recent work suggests that policies of encouraging the adoption of more efficient irrigation technology may not have the intended effect. Irrigation is said to be “productivity enhancing”; it allows the production of higher value crops on previously marginal land. Thus, a conversion to more efficient irrigation technology can induce a shift away from dry-land crops to irrigated crops, from less water-intensive crops to more water-intensive crops, or from drought-resistant varieties to varieties that require consistent rates of irrigation (Caswell and Zilberman, 1986; Lichtenberg, 1989). Even if the producer does not switch crops, the higher yields made possible through more efficient irrigation technology cause higher rates of evapotranspiration—the water actually consumed by the crop, resulting in less irrigation water being returned to the watershed either as recharge to the aquifer or return flow to surface water sources. Finally, in Kansas and other places where the rights system defines an annual limit to the amount of irrigation water that can be used by a producer, water “saved” through increased irrigation efficiency may be used on previously unirrigated land, thus increasing total irrigated acreage (Huffaker and Whittlesey, 2003). Ward and Pulido-Velazquez (2008) do a complete economic programming model analysis of the effects on yields, acreage, income, evapotranspiration, return flows, and water depletion of a policy that subsidizes the adoption of efficient drip irrigation in New Mexico’s Rio Grande Basin. Their study uses an economic model to predict the behavioral response of landowners in terms of acres irrigated, crop choice, and water application to the conversion to more efficient irrigation technology. They find that yields and net farm income increase under the subsidy, but water depletions never decrease due to changes in the mix of crops and higher evapotranspiration. If total irrigated acreage is allowed to increase, water depletions increase even more. In contrast to Ward and Pulido-Velazquez’s (2008) programming model, our study uses actual data on acres irrigated, crop choice, and water extraction in an area where a large-scale shift to a more efficient irrigation technology—dropped-nozzle center pivot systems—actually occurred in Kansas over a 10-year period. We empirically evaluate and measure the effect of this shift in order to determine if the observed changes resulted in the desired groundwater conservation. The state of Kansas has been subsidizing a shift towards more efficient irrigation systems; state and federal agencies have invested considerable resources in equipment cost sharing and technical assistance to farmers since about 1990. Between 1998 and 2005, more than $5.5 million was allocated to farmers through the Irrigation Water Conservation Fund and the Environmental Quality Incentives Program (EQIP). Such programs pay up to 75% of the cost of purchasing and installing new or upgraded irrigation technology. Figure 1 shows that between 1996 and 2005, while the conversion from flood irrigation to center pivot irrigation systems was well underway, many parcels were converted from standard center pivot systems to more efficient center pivots with dropped nozzles that suspend the sprinkler heads just above crop canopy. This conversion to more efficient systems of irrigation has not necessarily caused a decrease in water extraction, as discussed above. Figure 2 shows the average amount of water applied, per acre, to the five major irrigated crops grown in western Kansas under each type of irrigation system. Corn and alfalfa are the most water intensive crops, and wheat is the least water intensive. On average, the amount of water applied to crops with dropped nozzle center pivot systems is no lower than the amount applied to crops with flood and center pivot systems; for alfalfa, it is significantly higher. While it presents evidence of the unintended behavioral response to subsidized irrigation technology, Figure 2 does not account for changes that may have occurred over the time period of the data, physical characteristics such as soil quality and precipitation, or shifts in crop choice. 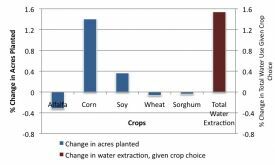 If farmers shift toward a more water intensive mix of crops as a result of the change in irrigation efficiency, groundwater extraction may increase even more than is suggested by Figure 2. On the other hand, if a decrease in precipitation has tended to correspond to the increase in the adoption of dropped nozzles, Figure 2 may be misleading because farmers applied more water in response to decreased precipitation. To separate these types of effects, we develop a structural econometric model to analyze a large dataset of more than 20,000 agricultural groundwater wells from western Kansas, over the years 1996 to 2005. The well locations are geo-referenced, and we match them to soil quality characteristics, precipitation, and hydrological information about the aquifer from which they are drawing. Our empirical model assumes that farmers optimize their cropping decisions to maximize profits. They choose between the five most common irrigated crops grown in western Kansas—corn, alfalfa, soybeans, sorghum, and wheat—or decide not to irrigate a parcel. Then, given their crop choice, they decide how much water to pump. Both stages of the estimation are important because irrigators can adjust their water use in two ways: along the “extensive” margin by shifting their cropping patterns, and along the “intensive” margin by adjusting groundwater extraction. The full effect, or the “total marginal effect”, is a combination of the two. The data are aggregated to the county level for the analysis in order to allow the evaluation of a causal link between irrigation technology shifts and groundwater extraction through the use of instrumental variables. The instrument we use for the adoption of dropped-nozzle systems is the dollars allocated to the cost-share program to subsidize the adoption of more efficient irrigation technology per county, divided by total farmed acres. The amount of money allocated to the county is correlated with the adoption of dropped-nozzle systems, but is assumed to not affect the amount of each crop planted in the county except through its effect on the use of irrigation technology. We control for average precipitation and soil quality, and account for crop rotation patterns. Only counties drawing water from the Kansas portion of the High Plains Aquifer system are included in our analysis. 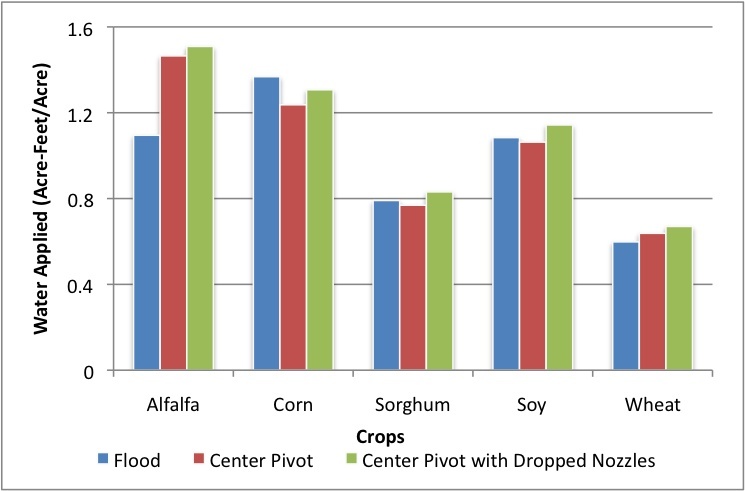 Figure 3 illustrates the results of the estimation of the effect of the adoption of dropped-nozzle center pivot systems on crop choice—adjustment along the extensive margin. 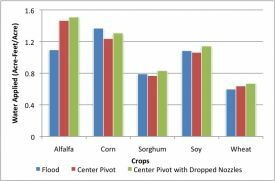 On average, for every 1% increase in the proportion of farmland irrigated by dropped nozzle center pivot systems, corn acreage increased by 1.4%, soybean acreage increased by 0.16%, and alfalfa acreage decreased by 0.3%. Wheat and sorghum acreage decreased slightly. These results indicate that farmers tend to shift toward a crop mix with relatively more corn—a water-intensive crop—when they adopt the more efficient dropped nozzle irrigation. Given a farmer’s choice of crops, we then estimate the effect of increases in the proportion of land irrigated with dropped nozzle systems on water extracted and applied to the chosen crops—adjustment along the intensive margin. The right-hand axis of figure 3 illustrates the result. A 1% increase in dropped nozzle irrigation is associated with an increase in water extraction of about 1.5%. Finally, the total effect of irrigation technology choice on groundwater extraction can be quantified by the total marginal effect—a combination of the effects on crop choice and water pumping. The results are reported in table 1. Our estimates indicate that for every 1% increase in the percent of acres irrigated with dropped nozzle irrigation systems, total water extraction increases by 1.8%, compared to what would have happened had the acres been irrigated by standard center pivot systems. Additionally, farmland that has the potential to be irrigated because it has an irrigation system installed, but was not irrigated, decreased by 0.24% for every 1% increase in dropped nozzles. These results indicate that when crop choices are considered, efficient irrigation technology does not reduce overall water use. It is unlikely that the shift toward more efficient irrigation technology has resulted in real water conservation in western Kansas. In fact, it significantly increased water use relative to flood and standard center pivot irrigation systems. The depletion of the High Plains Aquifer has become an important topic of policy in western Kansas, as it has in agricultural basins all over the world. Crop and livestock systems form the base of the economy and depend almost exclusively on water extracted from the High Plains Aquifer. As high volumes of water are extracted, the water table drops and extraction becomes more expensive. In some areas, the economic systems that depend on the water are not sustainable because recharge to the aquifer is very small. In order to make the water last longer, policy has focused on reducing rates of extraction. Policymakers must consider the legal ramifications of policies designed to reduce groundwater extraction; reductions in allowed extractions can amount to a taking of property, depending on the state’s groundwater laws. Third party effects are also a concern; seed and farm implement dealers, restaurants and other services, and even schools may be adversely affected by policies that reduce groundwater extraction. Therefore, voluntary, incentive-based measures are generally the most politically feasible types of policies to enact. Additionally, the full costs of such programs are rarely borne by the beneficiaries. A myriad of other states, regions, and countries have experimented with similar measures, often funded by state and national governments, and often with the help of international organizations in the case of developing countries. Whether or not increased irrigation efficiency will result in decreased water use is an empirical question, but most modeling efforts have provided evidence that it does not. Better irrigation systems allow more water intensive crops to be produced at a higher marginal profit. The farmer has an incentive to both increase irrigated acreage and produce more water intensive crops. Using a structural econometric model of crop choice and groundwater extraction, we provide empirical evidence that water “saved” is used to increase yields, shift to more water-intensive crops, and expand irrigated acreage. The subsidized shift toward more efficient irrigation systems has in fact increased extraction. These effects have not gone unnoticed by Kansas water conservation authorities, who have worked to end the subsidization programs. The lessons seem to remain unlearned, however, as many in the United States and around the world continue to recommend the subsidization of efficient irrigation technology as a method to reduce the consumptive use of water. On the other hand, it is not completely unrealistic to believe that improved irrigation efficiency could result in decreases in the consumptive use of water for agriculture. To attain results, however, such policies must be accompanied by corresponding decreases in the total water extraction allowed under the system of water rights, as well as restrictions on the conversion of previously unirrigated cropland. Additionally, the property rights system, reporting requirements, and legal enforcement must be strong enough for these regulations to represent real, enforceable limits on extraction. Burt, C. M., Clemmens, A. J., Strelkoff, T. S., Solomon, K. H., Bliesner, R. D., Hardy, L. A., Howell, T. A., and Eisenhauer, D. E. (1997). Irrigation performance measures: Efficiency and uniformity. Journal of Irrigation and Drainage Engineering 123 (6), 423–442. Caswell, M. F. and Zilberman, D. (1986). The effects of well depth and land quality on the choice of irrigation technology. American Journal of Agricultural Economics 68(4), 798–811. Huffaker, R. and Whittlesey, N. (2003). A theoretical analysis of economic incentive policies encouraging agricultural water conservation. Water Resources Development 19(1), 37–55. Lichtenberg, E. (1989). Land quality, irrigation development, and cropping patterns in the northern high plains. American Journal of Agricultural Economics 71(1), 187–194. Perry, C. A. (2006). Effects of Irrigation Practices on Water Use in the Groundwater Management Districts Within the Kansas High Plains, 1991-2003. U.S. Geological Survey and Kansas Water Office. Pfeiffer, L. (2009). Three Essays on the Economics of Groundwater Extraction for Agriculture: Property Rights, Externalities, and Policy. Ph. D. thesis, University of California, Davis. Natural Resources Conservation Service. (1997). National engineering handbook irrigation guide. Technical report, Natural Resources Conservation Service, United States Department of Agriculture. Ward, F. A. and Pulido-Velazquez, M. (2008). Water conservation in irrigation can increase water use. Proceedings of the National Academy of Sciences 105(47), 18215–18220. WIMAS. Water Information and Management and Analysis System. http://hercules.kgs.ku.edu/geohydro/wimas/index.cfm. Irrigation Technology Use in Western Kansas. Average Applied Water to Crops in Western Kansas by Irrigation Technology, 1996-2005. Lisa Pfeiffer (lisa.pfeiffer@noaa.gov) is an Economist at the NOAA National Marine Fisheries Service Alaska Fisheries Science Center, Seattle, Washington. C.-Y. Cynthia Lin (cclin@ucdavis.edu) is an Assistant Professor in the Department of Agriculture and Resource Economics at the University of California at Davis.